RUSH: I don’t know when it was that I first predicted to you that somebody was gonna come along and suggest that football be banned. Yesterday, in leisure time, I’m reading a bunch of Apple blogs trying to figure out what’s going on in the high-tech world. “When’s the next iPhone coming? What are the rumors? What’s it gonna have?” I’ve got a story: “What Would the End of Football Look Like?” It prints out to eight pages, and it’s on a tech blog. Not a sports blog. Not a news blog. It’s on a tech blog, which is populated by young liberals. “The NFL is done for the year, but it is not pure fantasy to suggest that it may be done for good in the not-too-distant future. How might such a doomsday scenario play out and what would be the economic and social consequences?” They go on and describe what’s gonna bring football down is all of these lawsuits over concussions and injuries, and this guy predicts once we have the suicide of a high school football player, that’s gonna be the beginning of the end. Then the parents aren’t gonna let their kids play. Then will come the lawsuits against the helmet-makers and the coaches and the trainers, and then it’s gonna be over. Now, Snerdley’s in there shaking his head. I can guarantee you this is going to happen. There are going to be lawsuits. This is it: A liberal tech blog. ‘Cause after all, football’s full of what? Violent, brutish bullies, when you get right down to it. Violent brute bullies who don’t know any better, who couldn’t do anything else in life, and so they are trained and programmed to make themselves insane with never-ending hits to the head. From the time they start playing Pop Warner all the way up to the NFL, if they make it. They are victims of a brutish culture led by the American people who want to see brutal hits and injuries every Sunday. You watch. It’s closer than you think. (interruption) “What happens if the lawsuits fail?” Well, I don’t know what happens, but they all aren’t gonna fail. One of them is gonna win. There are so many of them that one of them is going to win. There’s a giant one now, a class-action suit with now over a thousand NFL players, but there are smaller ones. But that’s not this guy’s point. His point is: When a high school player, because of too many hits to the head, takes his own life and they can say it’s because of concussions — or alleged it is… Or a college player not “dies because of an accident on the field,” but commits suicide because of it… My point with this is just that I know who these people are, and now that this is being speculated about on a tech blog, wait ’til the forerunners of the liberal sports media get hold of it. Even though their bread is buttered with this stuff, I know these people. Some of them are leading the charge and don’t even know it with the way they’re covering the sport. Some of them are leading the charge for getting the game banned and they don’t even know it! By the way they’re covering it. They’re demanding this and demanding all these new safety features, safety regulations, safety rules. Empowering the government to police the game. They’re begging for it, and they don’t even realize it. They, in their naivete, think they’re working hard to make the game safer and so forth, and all they’re doing is paving the way for the game to be banned. Because most liberals don’t understand the consequences of their success. What are the consequences of LBJ’s success and the War on Poverty? More poverty! Medicare/Medicaid? What are the consequences? Going broke! It doesn’t work. Liberals do not understand the consequences of their quote, unquote “success.” Their success is failure. December 14th is when I made the prediction, last year. December 14th, 2011. RUSH: Jane in Lake Oswego, Oregon. Jane, great to have you on the program. Welcome to Open Line Friday. CALLER: Thank you, Rush. I have to tell you that my husband has been a fan of yours since you were operating out of Sacramento. He listens to you regularly, and I can’t tell you how many times he’s wanted to pick up the phone and applaud you and add thoughts and so forth. He is a ten-year NFL vet, played in the fifties and the sixties, went to USC where he was a running back. RUSH: Let me tell you something about the NFL in the fifties and sixties. I mean it’s brutal today, there’s no question, but back then, clotheslining, for example, was legal. The equipment was not nearly what it is today. People like your husband played that game, and — as brutal as it is today, it was more so back then, I believe. CALLER: Well, I think you’re absolutely right. And I have to tell you, these are some of the toughest guys around. In fact, one of my favorite pictures of John is a picture where “Night Train” Lane is clotheslining him. In fact, it’s one of his favorite pictures. He looks at that and says, “Yeah, he was awfully tough.” I mean, that’s the attitude that they had back then. It’s great to hear these guys get together, too, and reminisce because they laugh about it. RUSH: She’s exactly right. The average human being wouldn’t last one play on the offensive line out — those guys are so tough, the average person wouldn’t last. And you’re right. I mean Chuck Bednarik beat the hell out of Chuck Noll one year. 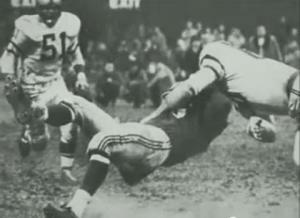 Look what he did to Frank Gifford back in fifties with a huge hit. I mean, Gifford was knocked cold for weeks. It’s a game now that’s under attack, Jane, and I’m telling you, there are well-intentioned liberals that think it’s too risky and too dangerous, and they’re going to try to change it, I guarantee you. And the liberal sports media doesn’t realize it, but they’re helping pave the way for it by the way they’re covering all this. CALLER: They are. And I understand your point on that, and I have to tell you, though, that I was not married to John — I’m a little bit younger than he is — was not married to John when he played but we’ve been together about 30 years, and it was when “Night Train” passed away, when I heard that there was not enough money to bury him and that he had been struggling. And I think that most people today do not realize that the guys back then didn’t make enough money to live on year round. RUSH: I know, they had jobs in the off season. Full-time jobs in the off season. Their careers nevertheless ended at the same time these guys’ careers do. It’s never been a lifetime career, either. This is another thing — the expectation now that the league should pay you for the rest of your life after you retire, where’d that come from? Good old liberalism. GrantLand: What Would the End of Football Look Like?